Bob Pest and Dale Cole place letters on the "Old" Landers Marquee. Thanks to the Fellowship Bible Church, the historic Landers Theater building has been meticulously restored, both inside and out. The Landers played an important role in the history of Batesville; many natives saw their first film, had their first date, or decided to get married there. Fellowship has been very generous in making the building available to the community, for a very reasonable rate, for everything from weddings to concerts. 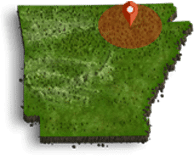 The annual Arts, Crafts, and Antique Festival is held there every October; country legend Narvel Felts has performed there; and the Ozark Foothills FilmFest will be screening several films there during this year’s festival (March 28 to April 1). Although the building has been fully restored, the marquee and Landers neon sign remain to be brought back to life. The lighting of the Landers neon will signal the completion of the project. The completion of the project will attract scores of visitors to see the new neon and reminisce about good times at the Landers. The neon sign will also contribute significantly to the ongoing revival of the Main Street historic business district. Batesville is fortunate to have such an iconic structure to enjoy and celebrate. Contributions of $2,500 or more may be spread out over a three-year period. Make checks payable to Landers Marquee Restoration Fund and mail to Fellowship Bible Church, 276 East Main Street, Batesville, AR 72501. Contributions are tax-deductible to the fullest extent allowed by law.